The car buying experience is evolving rapidly alongside changing demographics and business landscape. Success belongs to the automaker that can deliver a new customer experience that captures the imagination and wins the loyalty of diverse customers. It’s a challenging time to be a global automaker. Satisfying your customers was never easy to begin with, but today you need to consider an overwhelming number of customer profiles in different geographies and cultures. Diverse customers’ preferences may differ from one another, but one thing’s for sure: you urgently need to adapt to evolving behavior and expectations to win their loyalty. Amidst the challenges, however, lies the opportunity to set your brand apart. 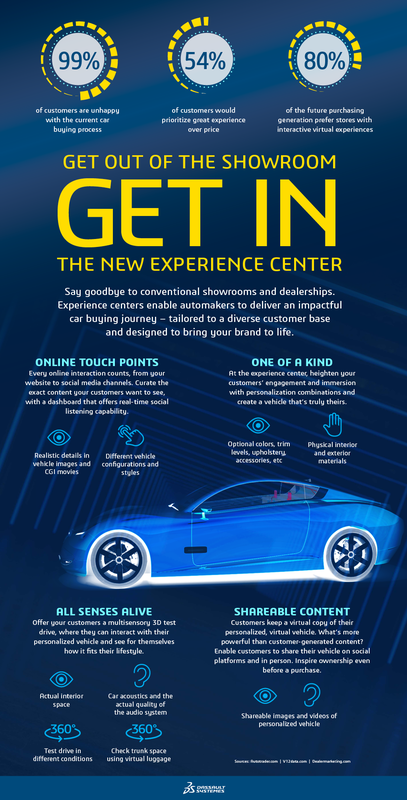 What if there was a way to transform the current car buying journey and deliver a new customer experience that exceeds expectations? Buying a vehicle is an emotional experience, and therein lies opportunities for an improved buying experience and brand engagement. Studies show that customer behavior is becoming more sophisticated and that there’s a growing segment of buyers who do a tremendous amount of research before stepping into a dealership. Many are turning to online sources; these customers spend up to 60% of their time on the internet. They are hungry for information that goes beyond specs sheets and two-dimensional images, and what other people are saying about your brand and products matter to them. Successfully determining what buyers want and need today is just the beginning. If that wasn't complex enough, they will soon experience vehicle technology that they can't even conceive of, let alone feel compelled to buy. The customers’ understanding and appreciation for this new experience is fundamental to the adoption and success of future vehicles. How can you bridge the gap? Customers have to experience vehicles to understand and believe in them. What will differentiate your products is the experience they offer and emotions they evoke. It’s all the more reason for your entire value chain to focus on the customer experience. Everyone in your vehicle creation process has a part to play, and every step from sketch to sale has to be oriented to an engaging, immersive and interactive experience. Our solution provides a limitless, virtual playground where the right tools are available for your design, engineering, marketing and sales teams to unleash ideas. They can take an idea, sharpen it and bring it to life through multi-channel marketing experiences that deliver narratives personalized to each customer. It’s a new storytelling capability that enables you to engage your customers in three dimensions. Give them an experience with incredibly detailed virtual environments that let them explore any angle. Customers don’t have to imagine what they are buying. They can experience their vehicles and customize it to the extent of their imagination before they make it a part of their lives. Imagine your designers and engineers experiencing a product in motion before the first physical prototype is even built. Imagine your marketing and sales teams taking data from the development process and creating 3D visualizations for personalized customer experiences. These solutions are already possible. The technology exists. Are you ready to get in and deliver the new customer experience?